Last Sunday afternoon, we drove the short journey to the book town of Hay-on-Wye, where we had an appointment with the author Robert Scourfield. He was launching his new book, a revised version of the Powys volume in the Buildings of Wales series. A few weeks ago, we investigated reserving seats for the discussion about the new book, but the Saturday afternoon slot described above was fully booked. Luckily, the talk was in such demand that the author agreed to repeat the discussion at 3:30 the following afternoon. Thus it was that we strode up the entrance path to Hay Castle on Sunday in the fading light of a dull winter’s afternoon. The discussion was to held on the Landmarc Stage, a small, intimate meeting room in part of what was once Hay Castle Bookshop where in past years I had purchased many of the old engravings and prints displayed on my website. 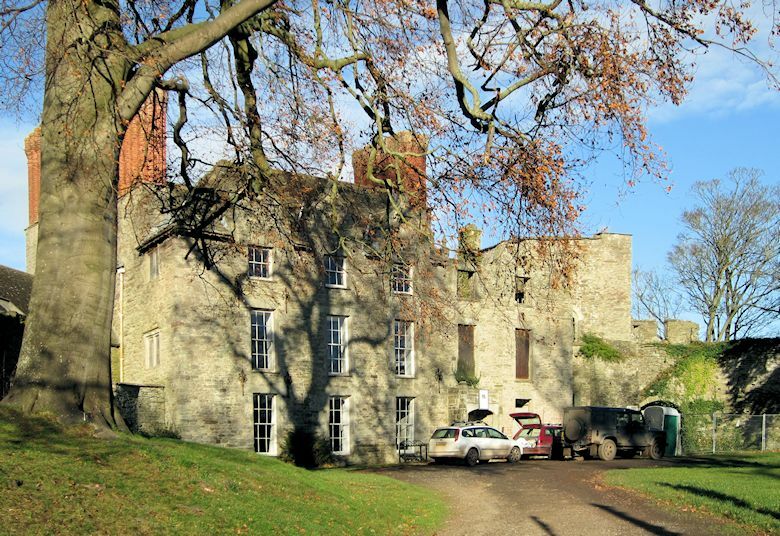 Hay Castle itself is one of the few surviving great medieval defence structures on the border of England and Wales. It was built in the late 12th century and has a long and turbulent history. Castle House, a Jacobean mansion, was built alongside the tower in 1660, but was severely damaged by fire in 1939, and again in 1977. Owned by bibliophile Richard Booth since the 1960s, the site was purchased in 2011 by the Hay Castle Trust. The subject of last Sunday’s discussion was the recent launch of the second edition (right) of an authoritative book on the architecture of the Welsh county of Powys. The previous edition (far right), published in 1979, was authored by Richard Haslam. 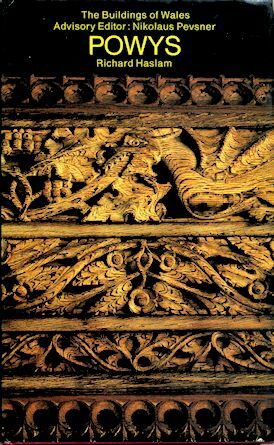 I dip into this book frequently when researching churches and other buildings for my online Welsh Churches and Chapels Collection. 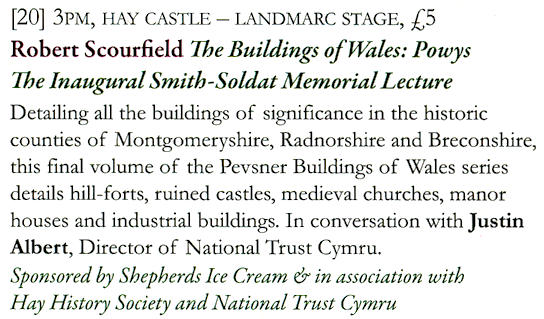 Robert Scourfield explained the background to the Buildings of Wales series, which was influenced greatly by the Buildings of England conceived in 1951 by Sir Nikolaus Pevsner. Robert also told us how his latest edition differs from the previous one. For example he includes much more information on chapels than his predecessor. Robert Scourfield is an impressive speaker: authoritative yet approachable. After the discussion, he took a number of questions from the floor and then retired to an adjacent room to sign copies of his book purchased by members of the audience. I understand I shall be receiving my own signed copy as a gift on Christmas Day. So I look forward to enjoying my first real taste of the book on Christmas afternoon. The Buildings of Wales: Powys by Robert Scourfield and Richard Haslam, Yale University Press, 2013; £35. Robert Scourfield is Buildings Conservation Officer for the Pembrokeshire Coast National Park Authority, and co-author of Pembrokeshire (2004) and Carmarthenshire and Ceredigion (2006) in the Buildings of Wales series. Richard Haslam is the author of the first edition of Powys, and co-author of the Buildings of Wales volume on Gwynedd (2009). 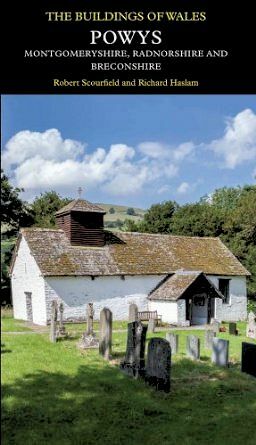 The historic counties of Montgomeryshire, Radnorshire and Breconshire are described in this final volume of the Buildings of Wales series, expanded and revised from the first edition of 1979. Prehistoric hill-forts and standing stones, Roman encampments, Early Christian monuments, ruined castles and the enigmatic remains of early industry enhance the landscapes of this wild and beautiful region. Atmospheric medieval churches survive in quantity, together with diverse Nonconformist chapels. Vernacular traditions are represented by robust medieval cruck-framed houses, and by the manor houses and farmhouses of the Tudors and Stuarts. Other highlights include Montgomery, with its beguiling Georgian heritage, the Victorian spa at Llandrindod Wells, and Powis Castle, with its Baroque interiors and terraced gardens.